Tap the power and effectiveness of 360 degree performance assessment, quickly and easily! Now, for just $495 - 17% off the regular $595 single-user price, and at just a fraction of the cost of other 360 software. But only before this introductory special expires. If youre not yet using 360 degree assesssments to magnify your team's effectiveness, now is your chance to climb on board with no risk! Just download the free demo to see what Survey/360 can do for you. Then, with a money-back guarantee, you can easily gain the phenomenal benefits of Survey/360 with the single-user version at the low introductory price of just $495 (+ $6 shipping & handling and applicable sales tax) - but for a limited time only! 1. SURVEYS - The coach and each team member agree up front on what performance is expected and how it will be measured with a performance survey questionnaire in S/360. 2. RESPONSES - Coach and assigned raters periodically enter their performance assessments on mini-surveys and finally on the full survey, giving ratings and feedback comments. 3. RESULTS - An automated 360 degree performance assessment is available on demand, based on the survey questionnaire and the ratings and feedback comments recorded in S/360. · Create and administer your own surveys with ease. With Survey/360, you easily create interactive 360 surveys in a fraction of the time needed by most other software tools. No special computer expertise required - if you can work with word processing software, you can handle Survey/360. And, you can quickly convert questionnaires you already have in word processing files to S/360. · Automated weighted scoring. Each question can be individually weighted so more important questions score higher. · Easily distribute your 360 questionnaires - raters can respond on-line, or you can bulk email the survey to them to respond and email it back, or you can print it out. Includes built-in distribution tools. Password security and response encryption for confidentiality included. · Low cost network version. When youre ready, for as low as $25 per person reviewed, you can get Survey/360's network program. Actual price per person depends on number of people reviewed - see "Pricing." · 360 degree effectiveness, proven worldwide. Performance management has been revolutionized by the concepts of 360 degree performance assessment, because of the greater objectivity of multi-rater assessments. You get it all with Survey/360. It really works! MONEY BACK GUARANTEE: If you purchase the single user version, and then are not satisfied with this product, just remove it from your computer and return it to us within 30 days for a full refund (network installations not eligible for refund). Compare Survey/360 features and benefits to any other 360 product on the market, and you'll wonder why they cost thousands more. Includes one year of free tech support by phone or the Internet. Now, at last, Survey/360 brings the power of 360 assessments within the grasp of those who could never afford it before. Order Survey/360 today and save! Dont miss out. The sooner you buy, the less it costs. Phone us right away at 1-800-872-0068. This special offer only valid for orders prepaid by credit card (Visa, MasterCard, Discover, or Amex), company check or money order. To fax your order: include your name, shipping address, phone #, product name, price (include. S&H, plus tax if in NY), credit card #, name on card and expiration. To buy now, just click on this link to the "Buy Software" button below. The regular price for the single-user version is $595, but purchase it during our introductory special and your price will be just$495$495 ! Please read license agreement before installation. If you get a "Trojan Virus" warning from McAfee, it's due to a mistake in an older version of McAfee. Click here for more info. After you find the above file name listed, just double-click it to start installation. To order, just click this button. 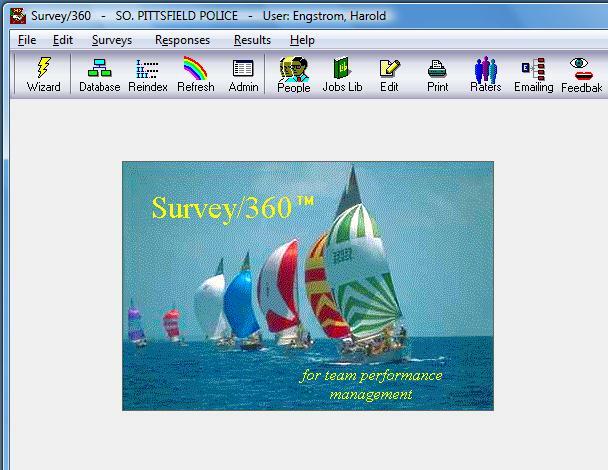 Lead the way to better performance with Survey/360! To purchase a single user version of Survey/360 with your credit card, just click on "Buy software." Or you can phone us within the USA at 1-800-872-0068. From outside the USA, call us at 845-358-0406. Remember, it comes with a 30-day money-back guarantee. To purchase a network version, please phone us. Our customer service office is open Monday through Friday, 9:00 AM to 5:30 PM Eastern time. Why you should buy now. - As you can see from our price schedule, you will get the maximum discount if you buy within 15 days of downloading the demo. After that, the discount is reduced the longer you wait. So start benefiting right now. Buy today at the Early Bird Discount price - saving you $216 - to give you full access to the power of Survey/360.